Absinthe has a bad rap. The potent greenish spirit, made from anise and wormwood, among other ingredients, was once thought to cause a whole host of side effects, including convulsions, hallucinations, mental deterioration and psychosis. Henri-Louis Pernod bought the recipe from a French exile in Switzerland and began producing it commercially in 1797. It wasn't long before the spirit's alleged symptoms tarnished its reputation, causing it to be banned in a number of countries, including Switzerland in 1908 and France in 1915. The symptoms were linked to a toxic chemical in the wormwood, not a consequence of the drink itself. Although the beverage is no more troublesome than other alcoholic drinks, the myth that it induces visions of little green fairies persisted for some time. The beverage underwent a revival in the 1990s and is now brewed by hundreds of different makers and sold worldwide. It might not cause you to see fairies, but it does pack a punch. Typically marketed with an alcohol content of 45% to 74% by volume, the spirit is meant to be cut with water and ice. 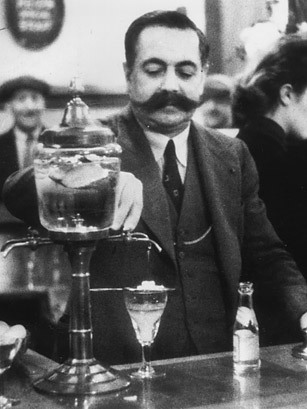 In proper absinthe bars, the drink is served with a special glass and slotted spoon, allowing the absinthe to drip slowly through a sugar cube and, as it mixes with water, turn a cloudy, whitish green.